*This post contains Amazon affiliate links. 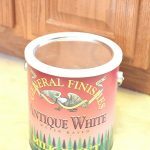 If you click on a link and make a purchase, I earn a small commission that helps fund this blog. Thanks! Hello! 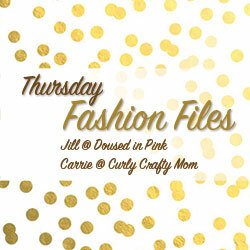 Today I am co-hosting at Thursday Fashion Files, which is co-hosted by my blogging friends, Carrie of Curly Crafty Mom, and Jill of Doused in Pink. 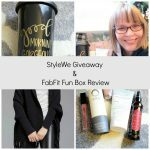 Thursday Fashion Files is a fun linky party and a space to share and get inspiration for outfits and fashion. Now it’s time to share my outfit for this week’s Thursday Fashion Files! I don’t normally consider myself a fashionable person. 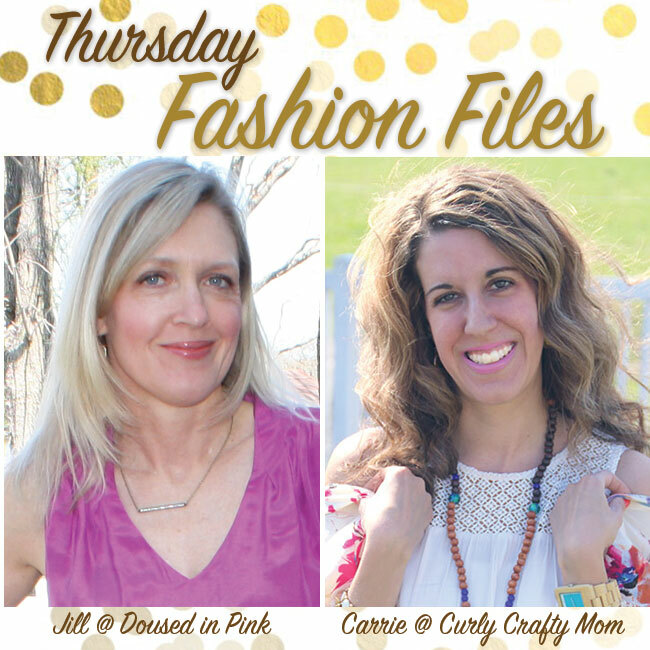 But after I picked up an adorable fringed flannel shawl in Princeton, NJ, one of my favorite places to shop, I texted my friend, Carrie, and offered to co-host her Thursday Fashion Files! I remember the day well when I found my shawl. I had taken my twin teen daughters into Princeton, NJ, for some bubble teas at one of our favorite spots in Princeton, Fruity Yogurt. (We especially love their bubble teas.) Before getting our bubble teas, we stopped in next door at Greene Street, an upscale consignment store on Nassau Street in Princeton. One of my daughters found this cute flannel cardi within minutes for me. 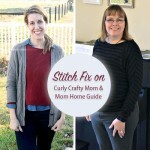 I tried the cardi on and was instantly in love — the cardi looks both like a flannel shirt, a trend I loved this past fall, and the kimono-style shirts that have been popular. Plus, this flannel shawl was only $10, so I had to get it! It is now one of my favorite fashion items. 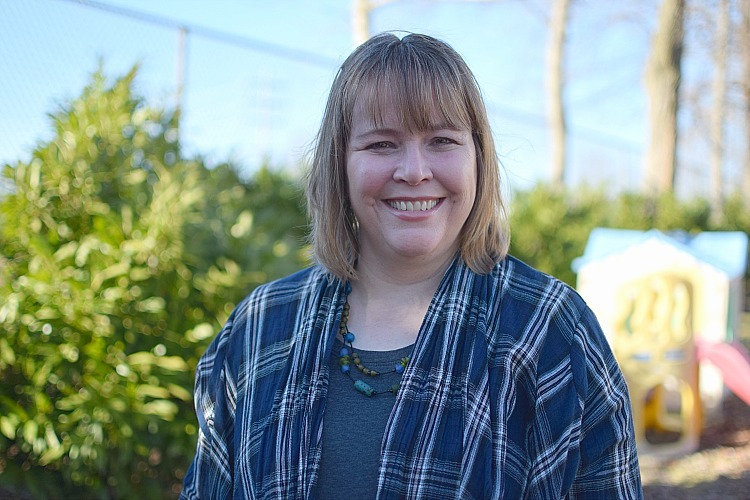 My other daughter took photos of me in this outfit on Saturday, when we had a beautiful and sunny 70° weather. I think my daughter got some nice photos for me! 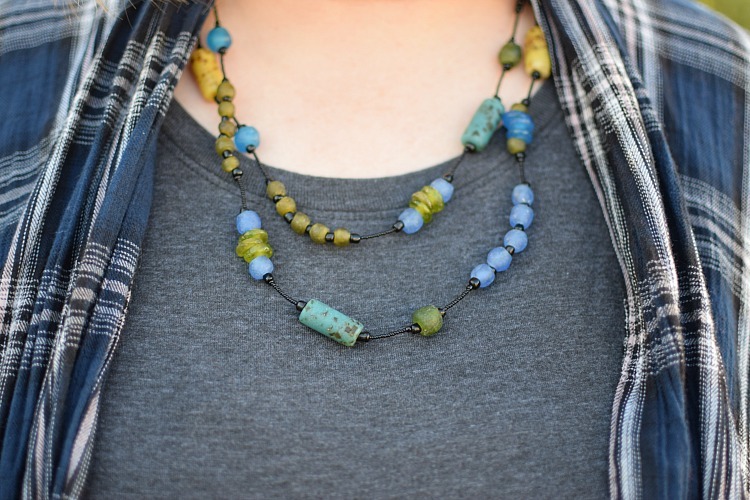 I wore the shawl with a green and blue beaded necklace — I love the color green. On my wrist you can see my new Silver/Plum Fitbit Alta Fitness Tracker that I love — my husband gave it to me for my birthday in January. I also paired the shawl with a Vera Bradley Front Zip Wristlet that features shades of pink brown and purple and simple Wood Beads Bracelets (like these on Amazon) . 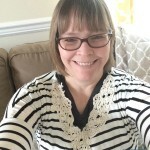 With my shawl I’m just wearing a simple Short Sleeve Gray T-Shirt (like this one on Amazon) and black yoga pants (similar to these on Yoga Pants on Amazon ). With the outfit I also wore a pair of Black Suede Mules (like these on Amazon) . I love these shoes! 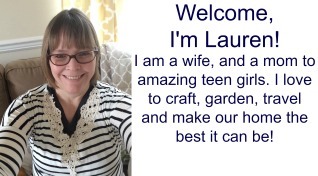 Lauren from is our co-host this week. You should definitely start to consider yourself a fashionable person because this is simply fabulous! 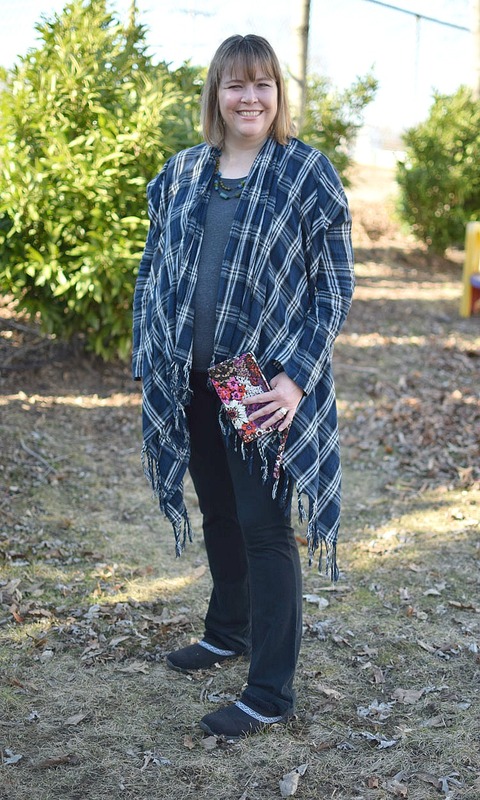 I am a huge fan of wraps/shawls, fringe, and plaid so of course, I adore this consignment find of yours! And you have styled it perfectly. Well done! Thanks so much Shelbee! I am glad you stopped by today! You are DEFINITELY a stylish lady! I love how you put this outfit together. The flannel cardi was a great find. 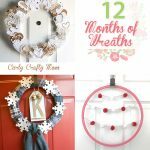 I started a new link-up a couple weeks ago and I’d love to have you! You gotta add this outfit! Thanks, Roxanne! I will have to join your link up! Thanks for stopping by today! 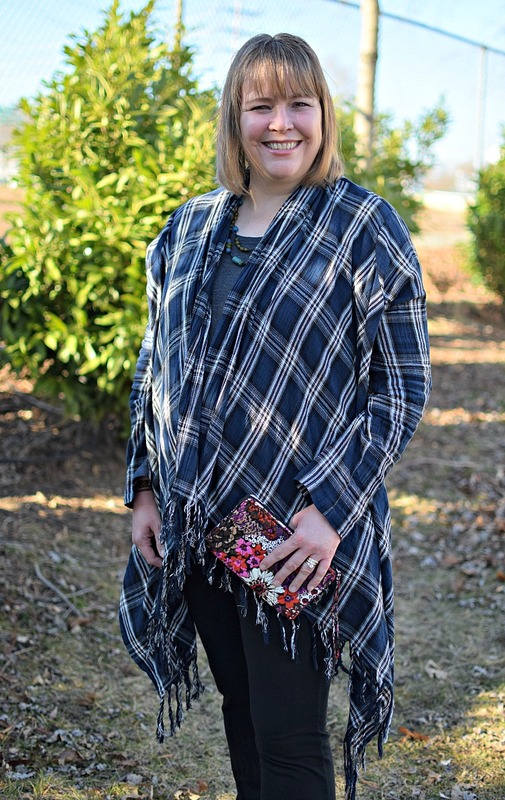 I am just in love with this flannel shawl! I also love that your daughters help you find bargains! That wristlet is really cute, too! I used to have a Vera Bradley bag, but I used it so much it is really worn and stashed away in my closet now. Thanks for co-hosting with us! Thanks for letting me co-host today! My daughters are so sweet — whenever I go shopping with them, they immediately start looking for things I’ll like! One of my daughters took the photos for this post – she put a lot of time into it! 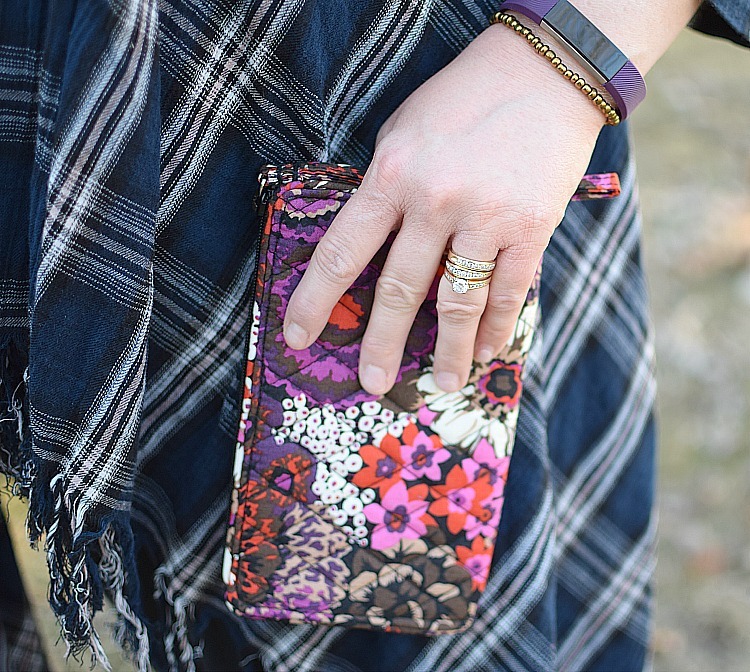 Hope you can get another Vera Bradley purse — they’re great! I love everything fringe so this is great! What a cute layering piece to have. I also love your little wallet clutch. Floral is so pretty and accents this outfit great! Thanks, Ruth! I love the fringe, too! Thanks for stopping by! 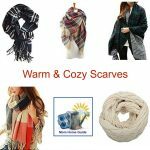 That flannel shawl is so cute and such a great find! Perfect styling! Thank you for joining us and co-hosting today!